Zimbabwe’s former president Robert Mugabe, 94, is to give a surprise press conference Sunday on the eve of the country’s first election since he was ousted from office last year, a spokesman said. “He is giving a press conference at Blue Roof (his private residence in Harare),” the spokesman, who requested not to be named, told AFP. Zimbabwe goes to the polls Monday in its first election since Mugabe was forced to resign last November after 37 years in power, with allegations mounting of voter fraud and predictions of a disputed result. Zimbabwe’s military generals shocked the world in November when they seized control and ushered Mnangagwa to power after Mugabe, who is in frail health, tried to position his wife Grace, 53, to be his successor. 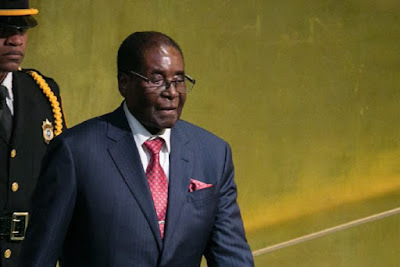 In his only previous press interviews since his fall, Mugabe admitted in March that “some errors were done” under his authoritarian rule, and said he thought his country was now “topsy turvy”.